The first ever Young Poet Laureate for London has been announced. Warsan Shire, 24, was chosen from a shortlist of six young poets. She will spend the next year creating work that reflects the ever-changing city. 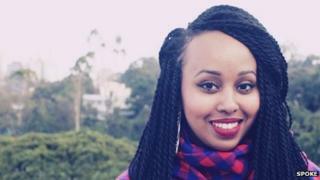 The Kenyan-born Somali poet will begin with a residency at the Houses of Parliament. The Londoner was announced by the current poet laureate Carol Ann Duffy at an event in Parliament as part of National Poetry Day. The scheme is launched as part of Spoke, a poetry and spoken word programme commissioned by the London Legacy Development Corporation. It aims to offer people the opportunity to watch, perform and develop careers in spoken word and performance poetry in and around Queen Elizabeth Olympic Park. Chief executive Dennis Hone said: "I congratulate all those who took part and have shown London is blessed with some really talented poets." He added: "The decision to create a Young Poet Laureate for London is one part of our ambitious plans for arts and culture in Queen Elizabeth Olympic Park and the surrounding area. "It is our vision for east London to be a thriving cultural district and Warsan as the first Young Poet Laureate for London will play a key part in that transformation."